In CAKE, the custom views in Reporting allows you to "Add Column". This is powerful because you can make custom calculations on analytics that are already in your CAKE instance. This functionality is most commonly used for KPI (Key Performance Indicators) and commission for Employees. To access the custom views of a report, you need to click the "Edit View" icon. This will open the Edit View card. On the Edit View card, click the Add Column button. To save the new column, you have two options. You can click Update View, which will change the current view you are on to include the new column. 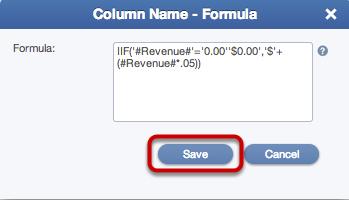 This will also auto calculate the new column. Your other option is to click the Create New View button, which will allow you to save this new report (with your new column) as a new report.